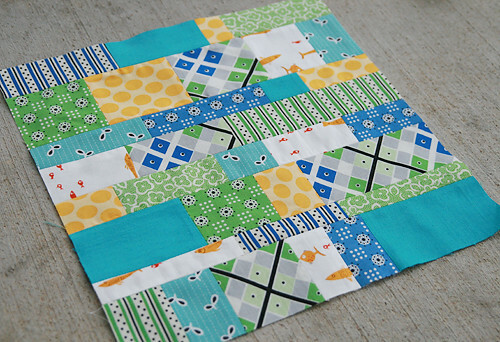 This is the first month for my new virtual quilting bee, Twice Around the Block VQB. We have half of the members from last year's bee and half new members. Kim kicked off the year with some really fun fabrics by Denyse Schmidt and Heather Ross. This was my first time seeing Flea Market Fancy blue seeds in real life. Let me tell you, they are even better in person. The solid turquoise is a Moda crossweave and it is *gorgeous*! I'm off to order some right now actually! Kim asked for blocks made from squares and rectangles. I decided to do strips of random heights and just worked myself down the block. Each piece is also a random width. I hope you like it Kim and I can't wait to see the completed quilt.